up to 60% less drag! significant time & power savings! superior aerodynamics & smart design! 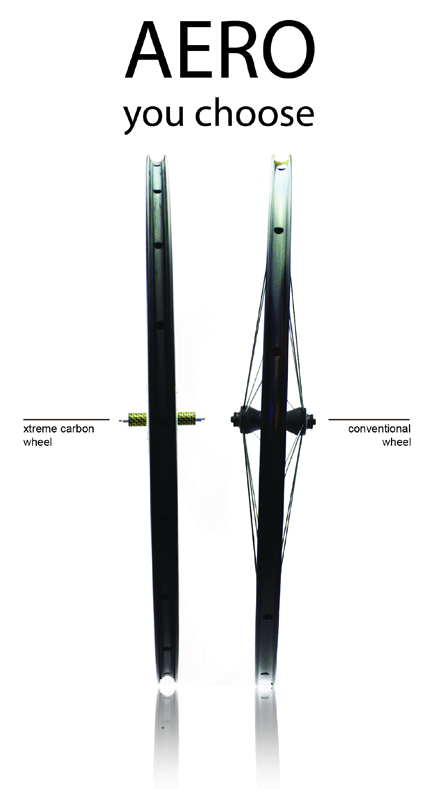 Xtreme Carbon knows that triathletes and time trialists have specific requirements when it comes to triathlon wheels. That’s why our carbon wheels have been designed to provide the greatest aerodynamic advantage on the market. Xtreme Carbon is the front-runner of wheel and component innovation, our unique AERO hub and axle design is the first of its kind. Designed with a centreline to centreline flange distance of 33mm, a significant reduction when compared to the 80mm of a conventional wheel. And the result? Lightweight, incredibly fast wheels that deliver the ultimate performance boost. Importantly, all our triathlon wheels are designed, manufactured and assembled in Australia to both the Australian Standards and ISO international quality standards. Learn more about our triathlon & time trial series wheels here. We also offer a race wheel hire service to triathletes and time trialists all over Australia. Find out more about triathlon wheel hire or get in touch if you have any questions. Xtreme Carbon is based in Sydney, Australia and offer our exclusive range of carbon wheels for purchase and hire through our online store. Throughout the year Xtreme Carbon has a strong presence at major triathlon events and industry expos giving our customers the opportunity to see and feel our triathlon wheels, understand the key features of our innovative design and discuss the benefits of choosing Xtreme Carbon wheels. Xtreme Carbon provides free worldwide shipping with every wheelset purchase. We reserve the right to verify purchases by requesting ID verification. All sales are in AUD and the exchange rates we apply will be the rates at the time of credit card authorisation. Xtreme Carbon is not responsible for any import fees, duty or VAT associated with the products we ship. All international buyers will be deemed the importer of record. Looking for Australian Triathlon Wheels or Time Trial Wheels? Our carbon wheelsets deliver free speed and a smooth ride every time. Race faster, ride better with carbon wheels from Xtreme Carbon. I’ve been riding the Race Grade 60s since February, and feel they offer the perfect balance of speed and responsiveness. A more aerodynamic hub and axle means the wheels have less frontal area and produce less drag force for a faster ride. The wheels roll forever, making it really easy to hold speed along the flats and downhill. They have a smooth and responsive feel, and feel really steady and stable to ride – even in windy conditions. The 60mm carbon rims are exceptionally versatile, and have been perfect for all my training and racing – plenty of hills, aerobic riding, TT efforts and triathlon events.